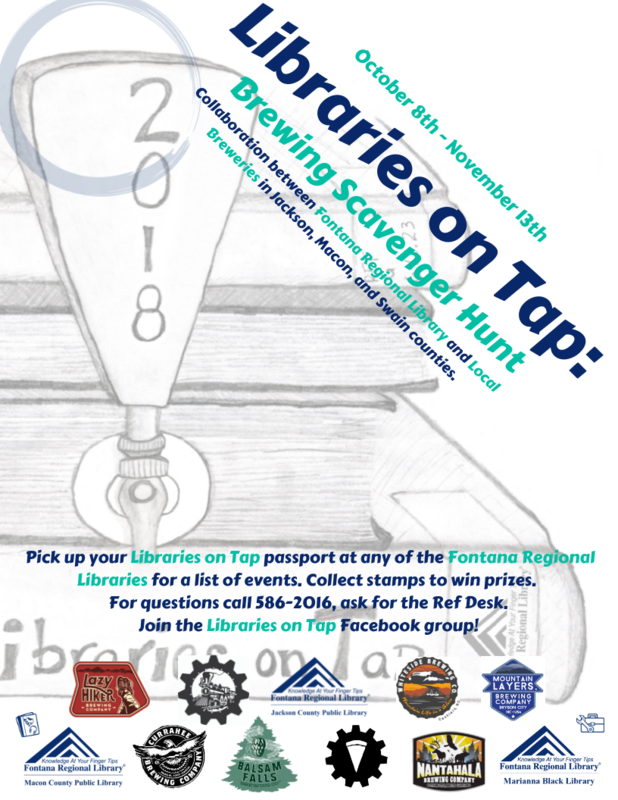 Fontana Regional Library is stepping out of the stacks to bring “Libraries on Tap: brewing scavenger hunt” to Jackson, Macon and Swain counties. “Libraries on Tap” is a collaboration between Fontana Regional Library and local breweries. The series is an interactive beer learning experience that incorporates fifteen individual activities, eight breweries, three counties, one passport and loads of fun. To join, stop by your local Fontana Regional Library location and pick up a “Libraries on Tap” passport, then collect stamps at the events and breweries to win beer-inspired prizes. The scavenger hunt will last for five weeks with a pre-hunt jump off event in Franklin at the annual “Books on Tap” Friends of the Macon County Public Library fundraiser on September 27th at Lazy Hiker Brewing Company from 5:00-8:00 pm. Tickets can be purchased in advance at the Friends of the Macon County Public Library Bookstore or at the Macon County Public Library for $30, or $35 at the door. The rest of the “Libraries on Tap: brewing scavenger hunt” events will run from October 8th through November 13th. Some examples of events involved in the scavenger hunt are Beer Bingo at Innovation Station, Tastings and Tours at multiple breweries, Home Brewing 101 and History of Beer at local libraries. If you’re interested in grabbing a bite, Pie Times in Sylva will also be serving up fresh, local ingredients and, of course, a stamp for your passport if you stop by! The final event is a book release by local award winning, craft beer journalist Anne Fitten Glenn at the Jackson County Library on November 10 @ 3pm! This event is free and she will have her book: Western North Carolina Beer – A Mountain Brew History for sale at the event! The events that are part of “Libraries on Tap” range in cost from free to $35. To see a list of all the events and the cost of each, please pick up a passport from your local Fontana Regional Library location or visit our Libraries on Tap resource page.